Zambia defender Stoppila Sunzu has joined French Ligue 1 side Lille on loan from China's Shanghai Shenhua. The 26-year-old will join up with manager Herve Renard for the third time having played under the Frenchman for Zambia and French side Sochaux. "This is very good news for me to join a club like Lille," Sunzu said. "I've known Herve Renard for a long time, his presence was an important element in my decision to commit myself to Lille. He is like a father to me." The pair enjoyed international success together in 2012 when Renard led Zambia to the Africa Cup of Nations title, with Sunzu scoring the winning spot-kick in a penalty shoot-out win over Ivory Coast in the final. Renard told the club's website: "Stoppila Sunzu is a very athletic defender, he also has the ability to go fast. This is a player who has many qualities, but can sometimes still lack a bit of maturity. He needs to be steered and that will happen playing with Renato Civelli or Marko Basa. 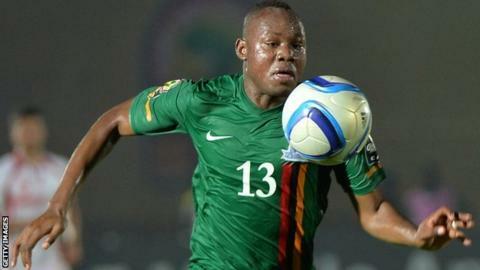 "During the African Nations Cup won with Zambia in 2012, he was our rock. Without him, it would have been difficult to achieve the final victory. His signing is a plus for our team."